This scam article is a classic example of why longevity in the offshore industry is not a reason to trust an offshore operator. While the Sportsbook.com enterprise of online betting sites, casinos and poker rooms have been a part of the US gambling industry for over a decade at this point, the company is better known for their complaints by customers rather than their stellar product. Slow-pays, incompetence and mistreatment of bettors by management are just scratching the surface for them and the Jazette Enterprises stable of online gambling sites. Jazette Enterprises, Sportsbook.com’s parent company do not have a strong reputation in their own industry. The company gained ground in the early days of the online gambling explosion in the US and much of the world. However, even during the height of the boom, Sportsbook still resorted to dishonest tactics to defraud and mislead bettors. 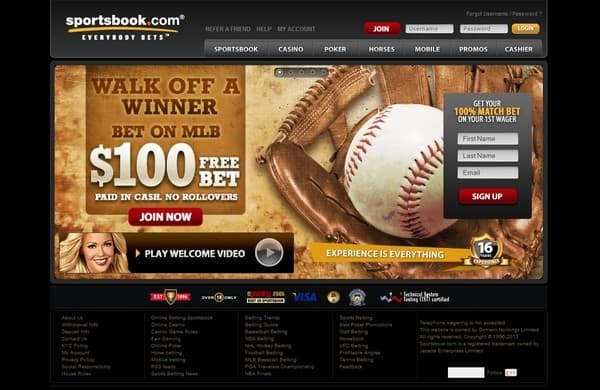 Sportsbook.com (now Sportsbook.ag) has been the company’s flagship site for years, but they own more than two dozen online gambling sites most of which offer players poker, sports betting and casino action. They were previously owned by Sportingbet, a large English bookmaker that trades publicly on the London Stock Exchange. The 2006 passage of the UIGEA forced many companies who operated in the US market to rethink their position, especially publicly traded companies such as Sportingbet. The company sold all of their US facing operations to a new company, Jazette Enterprises Limited for just $1. The US Government has been trying to fry them and other online operators since 2001. In October of that year, the New Jersey Attorney General sued the company and its affiliated sites, but the lawsuit never made it to court. The Sportsbook.com site premiered on the blacklist (used for fraudulent books) at SBR in 2001 – not what those in the industry would call a strong start to their foray into online betting. Their early days were so fraught with poor customer service, slow-pays and other shady dealings that watchdog sites and sports betting forums were receiving complaints daily. One of their tactics was to delay large withdrawals requests with so called “account audits.” These were usually “triggered” by four or five figure payout requests by customers. They would freeze a player’s account and launch an “investigation” into their betting history. Of course, in the majority of cases there was nothing untoward with the bets the players were making; Sportsbook simply did not want to pay winning players. Any player who won or held a sizeable balance, would be forced to jump through hoops when trying to withdraw. Audits and frozen funds were standard, as was the need to wait extended periods of time for their withdrawal requests. Many scambooks make a living off of this kind of outright thievery. They are happy to pay small players when they request a payout but will play games with players who happen to take them for big money or void their winnings altogether based on technicalities or predatory terms and conditions. If a site slow-pays or no-pays their top 1-2% of winners, they will almost always be profitable. Unfortunately, Sportsbook.com is not the only online bookmaker out there to figure this out. There are offshore bookmakers who have done this for a decade plus are still in operation. Even before the company and their US player base were sold to Jazette in 2006, the company already had plenty of complaints and shady business deals while acting as part of the Sportingbet family. One of their most infamous scam tactics wad voiding players winnings based on a dubious “bonus abuse” rule. Since the company ran a large number of sites, players often had multiple accounts at many of them, accepting the bonuses on offer when they signed up. This, of course, did not violate any rules and was not even listed in the fine print of the company’s terms and conditions. Players were not warned of this issue beforehand and unsurprisingly, players who lost did not have any funds returned. However, if players ran up a balance, all of a sudden they were bonus abusers. Not only was the bonus amount voided, but all the winnings across any associated player accounts with the individual were voided too. Luckily, Sportsbook was still kind enough to return their original deposit. There’s no justification for these types of tactics. What they did here was outright theft, plain and simple. Fortunately, Sportingbet decided to refund the players’ winnings after pressure from SBR and the sports betting industry. However, that does not make them innocent or absolve them of any blame. Without a community and watchdog sites, they would have gladly seized hundreds of thousands in player funds and would not have given it a second thought. In fact, they even tried doing it again two years later. After the 2006 sale of the website from SportingBet to Jazette, the two companies held a non-compete agreement in which Jazette agreed to not service non-US players and to refer international players to SportingBet’s non-US online sportsbooks. This seemed fair enough, but wait, there’s more! It turns out that Jazette would be cancelling all pending future wagers that all US bettors place before the sale of the company. Yes, that’s right! Despite picking up their clients, referring them to sportsbooks and transferring their balances, they would void any pending futures wagers, regardless of the outcome of the bet. This outraged players and when they all rushed to cash out, a new litany of payout complaints surfaced. Some players even alleged that the site was not even refunding the amount of the pending wagers on the future bets! They were literally holding on to funds that were deemed no action and now frozen by the book. This type of practice is certainly not done by any reputable bookmaker and was one of the straws that broke the camel’s back in the relationship with sports bettors and industry experts. After all, it was not the first strike against Sportsbook – the company had a lousy reputation for years – but this egregious decision left everyone in the industry shocked. Much of 2007 and 2008 were filled with more complaints from players and more incompetence on the part of Sportsbook.com. Players were waiting months for wires and checks, despite the site’s insistence that they would be paid out much faster. When players inquired regarding the withdrawal issues, management used vague terms, such as “were working on it” or “we’ll get it to you soon”, giving players little to no information about when they should receive their funds. Withdrawals in many cases were taking 2-3 months to process. They also regularly graded games wrongly or were often late to settle wagers, which was part of their “we’ll find a way to not pay you if you win” mantra that the company stood behind strongly. Of course, they usually came around after months of harassment from the industry and players alike, but it was clear to everyone that this company was run by scumbags. Having to run down a professional bookmaker for withdrawals or to fix a grading error is pathetic, especially when it takes them weeks or months to finally fix the issue. These stories above are just the tip of the iceberg. Sportsbook and their sister sites have stolen hundreds of thousands from players, seized balances for correlated parlays and voided live betting wagers and much more. Anyone who had followed this book since their inception knew they were a terrible option for not only US bettors, but any sports bettor on the planet. Despite years of misleading players and giving them the run around with payout requests, they still operate today and get a lot of customers from players who simply just do not know any better. In one incident in March, 2012, they confiscated $35,000 in casino blackjack winnings from a player they accused of card counting. And yes, you did read that correctly. The player ran up his balance in one evening of betting $25 and $75 a hand playing online blackjack at the casino. He immediately wanted a withdrawal and sent the request after sending his identification details to management for verification. Management validated his documents and verified that the payout was being processed. After playing for another two days, the player ran up his balance to a whopping $30,000. A few hours later he received an email that his payout request was confirmed, and it would take 6-8 weeks to arrive by check. The next time the player logged into his account he found his account disabled and his funds frozen. He called customer support and they told him that a manager reviewed his account, and his winnings were voided because he was “counting cards.” A ridiculous claim and no doubt another tactic to get out of paying someone who actually beat them out of money. As this SBR Newswire story proves, a provision was added to their casino terms and conditions, days after the incident took place. This new provision prohibited card counting and deemed all winnings from such activity as void. Of course, that is not what they told the player or the independent arbitrators who were trying to help the player get the money owed to him. Using Google’s cache feature, it was clear that the terms were added after the alleged card counting had taken place; they were then retroactively enforced in order to void the player’s winnings. This disgusting action proves how manipulative and scummy Sportsbook.com was to their players. Though they eventually caved and agreed to pay the player his winnings, one must wonder if they would have done so without the evidence that clearly showed they changed the t+cs after the fact. Still Pays Players, are they Seriously that Bad? Unequivocally, yes. Firstly, they do not pay players on time or even within a reasonable time frame. Sure all companies have delays, but when a site is taking 2+ months to pay players – even in today’s market – that is a cause for concern. Either that, or they are just lazy and greedy. They are certainly not broke and have the money to pay. Instead of sending cashouts like any other reputable company, they force players to jump through hoops and look for any reason imaginable to void a player’s winnings. Many posters on internet forums claim they pay quickly and love the book, but we doubt they have won large sums of money at Sportsbook.com or their sister sites. If they had, we think they would be singing a different tune. Even in the much less reputable and limited US online sports betting market, there are loads of better options for sports bettors. Yes, they have a long history and have been around forever, but unlike other bookmakers who have used their business acumen to succeed with their business, they instead honed their skills on misleading players and working on new ways to void the legitimate winnings of their customers. Steer clear of Sportsbook.ag and other Jazette properties.